As the sun rises over Mali’s vast desert, a group of 20 men prepare their equipment and line up to receive instructions before heading out for their first patrol of the day on one of the most dangerous roads in the region. 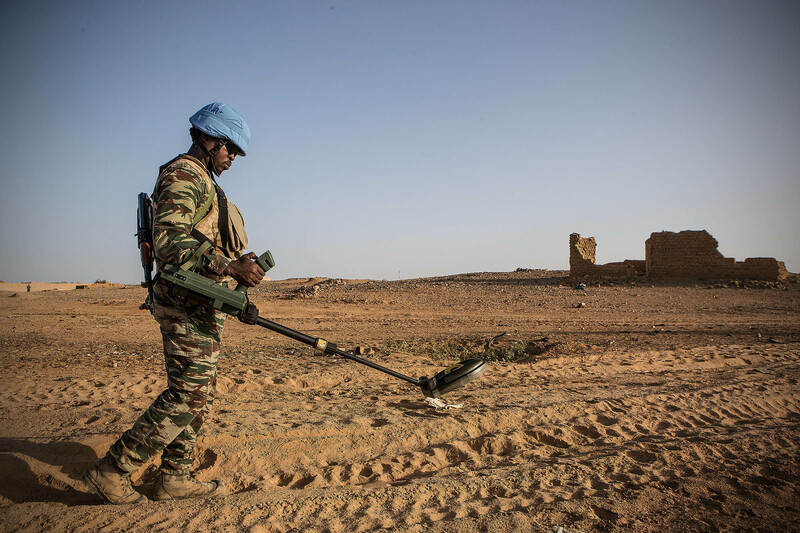 They are Guinean Blue helmets from the United Nations Multidimensional Integrated Stabilization Mission in Mali (MINUSMA) based in the volatile town of Kidal, in the north. The heart of the Saharan desert is under constant threat by hostile forces. Following the outbreak of the conflict in 2012, explosive hazards and complex attacks have become a new threat in the country, with a broad-ranging, detrimental impact on the safety and freedom of movement in the central and northern parts of the country. They are ready. Guinean peacekeepers climb into two armored personnel carriers (APC), that would rumble out the UN base soon, not knowing whether they will return safely. For Guinean Sergeant, Mamady Keita, the threat of landmines is always present, “No mission can be done without our presence, the road is sandy and easy for the insurgents to hide explosive devices underground, “ he said standing outside his APC, his best defense during the operation. Under a blazing sun the temperature is reaching its peak, the so-called Search and Detect Guinean team, on foot, carefully search for explosive devices and hiding places for these bombs, looking at the sandy roads. “Out here, dropping your guard can be fatal, there is always a chance that the situation gets a turn to the worst”, Lieutenant Maurice Brehemon said. All Guinean soldiers, like all military contingents joining the MINUSMA, have to go through intense in-country pre-deployment training on explosive threats and risks. They must be prepared for the most common risk when they arrive in Mali. These pre-deployment training measures are to better equip the Blue helmets with skills to protect them, help them protect others and improve resilience and safety for the delivery of the MINUSMA’s mandate. The job comes with daily challenges. This morning patrol was uneventful, and the Blue helmets returned safe and sound to the base. But the next day, a UN vehicle run over a mine. Fourteen peacekeepers were injured. 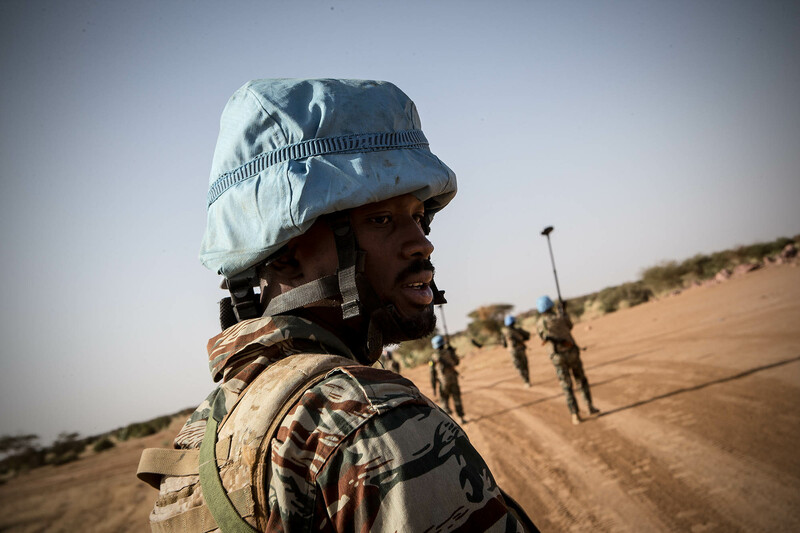 Almost 850 peacekeepers from Guinea are serving in Mali. Guinea is one of the largest contributing countries to MINUSMA. Mamady knows he is risking his life while promoting peace. Guinea is a neighbor country with strong ties to Mali. Its soldiers are often called “brothers in arms” in a regional sense. Established in 2013, MINUSMA supports the Malian peace agreement by helping to restore the State authority, advance diplomacy, strengthen security and promote human rights. Every day the women and men of the United Nations mission in Mali are on the frontline to protect civilians and promote peace in one of the most challenging missions on Earth. Since July 2013, 103 peacekeepers have been killed in hostile incidents. Between landmines and improvised explosive devices, driving on the roads of northern Mali is a dangerous exercise. 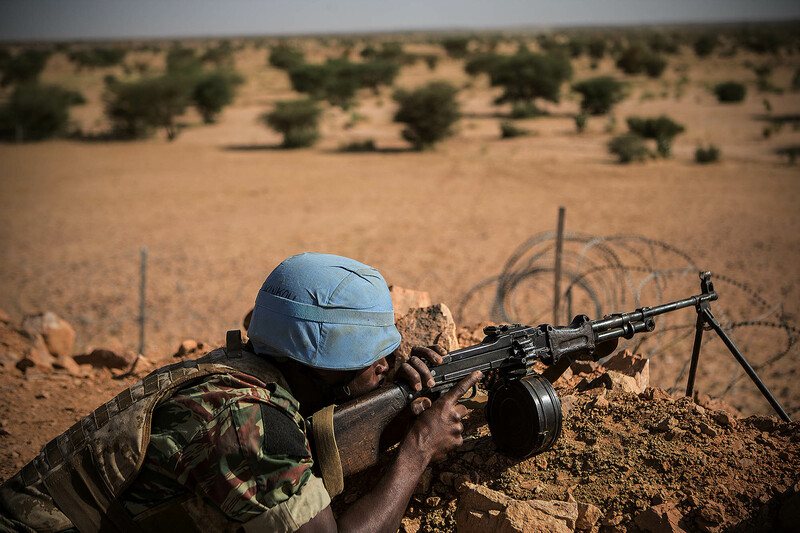 Today, some 14,000 UN peacekeepers from more than 56 countries are serving in Mali. These women and men are working in an extremely dangerous environment, far away from their families, and very conscious of how their personal sacrifice is crucial to helping build a durable peace.